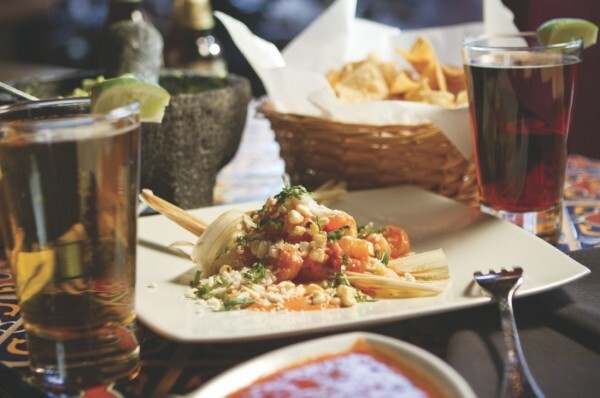 With hundreds of great Mexican eateries in our state, there is certainly no shortage of venues in which to celebrate Cinco de Mayo, which is actually a bigger “holiday” here than in Mexico. Well, I’ve whittled the choices down to 10 of my very favorite south-of-the-border restaurant dishes. Maybe we should embark on a Cinco de Mayo stroll to taste all of them. Rather than ending with a bang, let’s begin with one. One of the most elegant and delicious Mexican dishes I ever ate was chiles en nogada, which I encountered as part of a family meal in Puebla. At the time, I couldn’t quite believe my eyes; it looked like something that belonged on the cover of Gourmet magazine, not the everyday Mexican fare I was used to. Chiles en nogada (chiles with walnut sauce) is usually made during the Christmas holidays in Mexico and features the colors of the Mexican flag: green chiles topped with cream-colored walnut sauce and bright-red pomegranate seeds. At Frida Bistro (545 W. 700 South, 801-983-6692, FridaBistro.com) it’s a roasted poblano chile pepper stuffed with picadillo—an intricate combination of shredded beef, minced sun-dried fruits, nuts, spices and seasonings—and finished with walnut-crema sauce and pomegranate seeds. Though it’s much more pedestrian, but delicious nonetheless, I never tire of the smothered burritos at La Puente (multiple locations, LaPuenteSLC.com). Large flour tortillas are filled with refried beans and smothered in an orange-green chile verde “gravy” with tender chunks of roasted pork. I’ve never quite figured out what gives the gravy its orange hue, nor have I ever been able to successfully replicate the recipe at home. There’s eternal gratitude awaiting anyone who could send me a recipe for the Chicano-Mexican chile gravy served at La Puente, La Frontera and Lorena’s. Beans, of course, are a staple of Mexican cooking. Now, normally I don’t make a brouhaha of bean dip; it’s an afterthought at most Mexican restaurants. Not, however, at Luna Blanca Taqueria (3158 E. 6200 South, Holladay, 801-944-5862, LunaBlancaTaco.com), where the bean dip is the bomb. It’s the perfect appetizer with a cold cerveza or Margarita: creamy pinto beans blended with caramelized onions, roasted pasilla peppers, crisp cinnamon-scented carnitas pork, and broiled with slightly browned Monterey Jack cheese on top. I’d be remiss not to mention Red Iguana (multiple locations, RedIguana.com), although Utah’s most popular independent Mexican restaurant doesn’t really need my help. I love the can’t-miss staples like chile colorado, cochinita pibil, the Sonora-style shrimp and a dozen other dishes. But what I think Red Iguana does better than anyone else is its moles. They are complex, rich sauces, usually made with ingredients like Mexican chocolate, fruits, nuts, chiles and the kitchen sink. They’re all good, but my favorite is the mole amarillo: yellow tomatoes, golden raisins, yellow zucchini, zippy aji, guajillo and habenero chiles tossed with poached chicken. It’s incendiary and irresistible. Meanwhile, over at Blue Iguana (165 S. West Temple, Salt Lake City, 801-533-8900; 255 S. Main, Park City, 435-649-3097, BlueIguanaRestaurant.net)—no relation to Red Iguana—I recommend the admittedly unusual-sounding tacos filled with shrimp, pineapple and chorizo. It’s a unique combination: an explosion of flavors on the tongue, ranging from delicate shrimp and sweet pineapple, to spicy chorizo sausage. Somehow, it just all works. Another taco not to miss, and far from ordinary, is the duck confit taco at Taqueria 27 (1615 S. Foothill Drive, 385-259-0712, Taqueria27.com). Yes, I said duck confit. Stuffing a taco with this French delight might be bending the Cinco de Mayo rules a touch, but how can you resist Taqueria 27’s housemade masa tortillas stuffed with delectable shredded duck confit, fire-roasted vegetables, and adorned with smoky-spicy chipotle-crema and crisp fried leeks. By the way, Taqueria 27 fans will be happy to know there’s a new location opening in Holladay very soon. For the most authentic Mexican cooking in a family-style atmosphere, it’s hard to top the almost-off-the-grid Rose Park eatery called Julia’s (51 S. 1000 West, 801-521-4228). Of note here are the caldos: generously portioned bowls of soups and stews. They are all great, including the awesome chicken soup and the seafood version. But my favorite is the goat soup called birria. It’s not much more than shredded goat meat and bones simmered endlessly in a fantastic broth with some corn tortillas on the side: simple and sensational. At the other end of the Mexican spectrum from Julia’s is the beautifully appointed and upscale Alamexo Mexican Kitchen (268 S. State, 801-779-4747, Alamexo.com). It’s there that you’ll find one of the best tamales in town. It’s called tamal de elote, a freshly made, slightly sweet masa (cornmeal) tamale made with seared shrimp and luscious chipotle-cream salsa. The tamale is “deconstructed” and served on a bed of dried cornhusk strips—as delightful to the eye as it is to the palate. At Midvale’s El Mana restaurant (7962 S. State, 801-563-5196) the friendly service really stands out, as does the home-style Mexican fare. The fish tacos, birria de res, menudo and lamb tacos shouldn’t be missed. But, my favorite El Mana treats are the sopes: thick, scrumptiousÂ masaÂ patties topped with a choice of beef, chicken or pork, along with onions, lettuce, sour cream and cotijaÂ cheese. Finally, you need to travel for Utah’s best posole, but it’ll be well worth the scenic drive to Hell’s Backbone Grill in Boulder (20 N. Highway 12, 435-335-7464, HellsBackboneGrill.com). Co-owner Jen Castle hails from New Mexico, so she knows her posole. My favorite Hell’s Backbone variety—there are lamb and squash versions, too—is the most traditional: a stew made with hominy, tender pork shoulder, onions, celery, garlic, herbs, spices and, most importantly, a rich, zesty red-chile sauce. It’s posole perfection.